The upcoming Union Budget to be presented on 1st February 2018 will be the last regular budget of the NDA government before the general elections in 2019. Thus I expect this to be a populist budget and the middle class can hope for a big income tax relief. We expect the government to hike the personal income tax exemption limit and tweak the tax slabs. This should be in line with the proposed Direct Tax Code which is being prepared. I expect the government to provide some relief to the middle-income group, especially the salaried class, to help them overcome the impact of increasing retail inflation. There is a suggestion to re- introduce standard deduction for salaried employees up to Rs. 1 lakh to ease the tax burden keeping in mind the rate of inflation and purchasing power of the salaried individual. Standard deduction was abolished with effect from assessment year 2006-07. There is a proposal to hike the personal income tax exemption limit from the existing Rs. 2.5 lakhs p.a to Rs. 3 lakhs p.a. This could ultimately be increased to Rs.5 lakhs & all tax exemptions withdrawn under the direct tax code as and when it is implemented. There is an expectation to lower the tax rate to 10% on income between Rs. 5 lakhs and Rs. 10 lakhs, 20% for those with income between Rs. 10 lakhs and Rs. 20 lakhs and 30% for income beyond Rs. 20 lakhs. In the last budget, finance minister Arun Jaitley left the tax slabs unchanged but gave a marginal relief to small taxpayers by reducing the rate from 10% to 5% for individuals having an annual income between Rs. 2.5 lakhs and Rs. 5 lakhs. 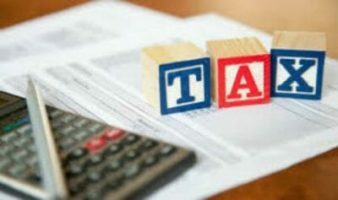 The corporate sector expects the government to reduce the corporate tax rate to 25% from 30% (average statutory tax rate currently is 34.47% including cess). The government may reduce tax rates by 100-200 bps but a steep reduction is unlikely given the higher than expected fiscal deficit this year. In last year’s budget, the government had brought down the tax rate on smaller companies with revenue less than Rs.50 crore to 25%. I feel that, if the government lowers the corporate income-tax rate, it will also reduce some tax exemptions so that net tax collection for government remains the same. Thus some industries which pay more tax may benefit while industries which enjoy tax benefits may lose out. There has been a significant slowdown in the economy & the need of the hour is to boost domestic demand. Thus there is a high possibility to reduce income tax rates which would leave more money in the hands of the ‘Aam Aadmi’ for consumption. The Government will on the other hand focus on getting more people to pay taxes to compensate for the loss.